The project begins with a hypothesis that the kinds of contacts needed when people are brought together across cultural divides in order to bring about improved community relations need to be better understood; it isn’t enough simply to occupy the same public spaces. The aim of the project is to transform the classroom experience of pupils within Religious Education by improving teachers’ capacity to promote good community relations through lessons in RE. Westhill Endowment has funded two phases of this project. 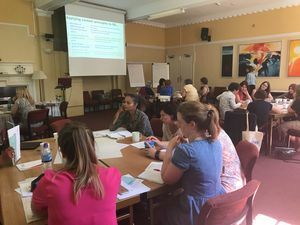 The first phase involved devising and administering a national survey of teachers of RE and analysing the findings with University of Bristol partners. As a result, we understand more clearly and robustly ways in which RE lessons may promote better community relations where they use three distinct and pedagogical elements: encounter, conversation and interaction; and where RE teachers receive wider institutional support from senior leaders in schools and others. With the support of additional funding from an ESRC IAA Impact Award, a teachers’ toolkit was created and is available on the NATRE website. 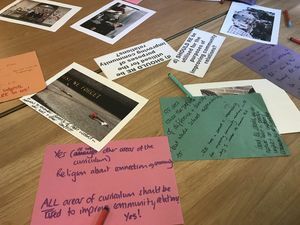 The second phase of the project brought together 24 educationalists including teachers and advisers who were passionate promoting community relations at a residential seminar in Birmingham. The aim of this was to equip delegates with the tools they needed to use and share the toolkit in their schools and networks, and to benefit from a knowledge exchange allowing an innovative interface between theory and practice. The project has provided a practical resource for teachers to use in the classroom, as well as publications making the findings accessible to practitioners and policy makers. The project has been shared widely at national conferences organised by NATRE as well as papers presented at academic and adviser seminars. The University of Bristol and NATRE are continuing their partnership through a new ESRC Impact Acceleration Award for 2018-19. The aim is to extend the use of the toolkit through teacher networking in the UK and Hong Kong and to evaluate its impact.